Honda and Kawasaki Models Available. Yamaha and Honda models available. Choose from a variety of Buggies and Side X Sides. San Diego Motorsport Rentals is San Diego’s #1 spot for ATV Rentals. 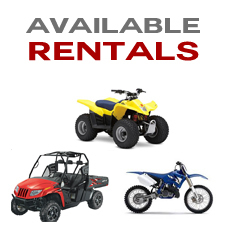 San Diego Motorsport Rentals carries the best makes and models of ATVs, Quads and Dirt Bikes. All ATV rentals come ready to ride. When renting an ATV, Quad or Dirt Bike we include the helmet, gloves and goggles FREE OF CHARGE. Now that you’ve got a great ATV and great gear, it’s time to ride. Our experts will walk you through all the safety and riding protocol and then you’re off to ride on some of the best ATV riding areas in the country. SD Motor Sport Rentals is the leader in dessert rentals and repairs, we offer all of your ATV (All Terrain Vehicles) equipment and supplies at the best prices, we are minutes away from Pacific and Ocean Beaches in San Diego. All of our employees are trained in dessert safety and operations which we pass on to our renters to ensure their safety and enjoyment while engaged in dessert sports activities all over San Diego County, Glamis, and Ocotillo Wells. ATVS, SIDE X SIDES, AND DIRTBIKES!